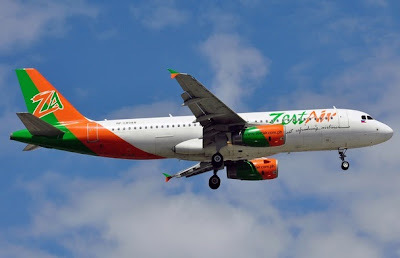 Manila, Philippines - Around 7,600 passengers nationwide are affected by today's suspension of low-cost airline Zest Airways' operations or license to fly due to various safety issues raised by the Civil Aviation Authority of the Philippines (CAAP). CAAP sent a letter to Zest Air dated August 16, 2013 stating that CAAP officer-in-charge Capt. John Andrews was alarmed by the company's series of "serious deviations and infractions" of the rules and standards under the Philippine Civil Aviation Regulations. CAAP said that suspension will be lifted only if all all the necessary corrective actions and compliance with aviation safety standards were assured by Zest Airways. The decision came out after the results of conducted surveillance 3 weeks ago to check if Zest Air already complied with safety procedures. Lack of qualified accountable manager, a position formerly occupied by Capt. Ely Tabora. Failure of the flight crew to check aircraft logs, flight manifest and weather, and failure to present the airman license to the CAAP during ramp inspection. Excessive flight duty time. Several pilots have exceeded the 100 hours flight time limit per month due to the rise in flight operations and flight crew shortage. Meanwhile, the management of Zest Air said that it will offer full refund to passengers who were affected by the suspension and expects and safety issues will be resolved by next week. Zest Air, a Philippine-based airline under business tycon Alfredo Yao operates scheduled domestic and international services, mainly linking Manila with 9 domestic destinations and international points in Asia via its hubs in Kalibo and Cebu. Malaysia's AirAsia Berhad, through local unit Philippines’ AirAsia Inc. controls Zest Air.